When puddles frost on the streets and you scurry into the house escaping winter’s wrath, there’s nothing better than a warm bowl of beef stew with white rice and tostones. Even in the unforgiving summer heat, I love to cuddle up with a bowl of stew in my reading nook. As you can gather, I love stews and beef stew is my favorite. It’s the definition of comfort food and what it means to feel at home. I love this dish in particular because it’s a dish that crosses national and ethnic boundaries. There’s a version of it in each culture and in each home. It’s a dish that you can easily make your own and a dish that can serve as your reprieve on a tough day. The longer it sits and stews, the better it tastes. You can add all the veggies and seasonings that you like and still end up with a masterpiece. 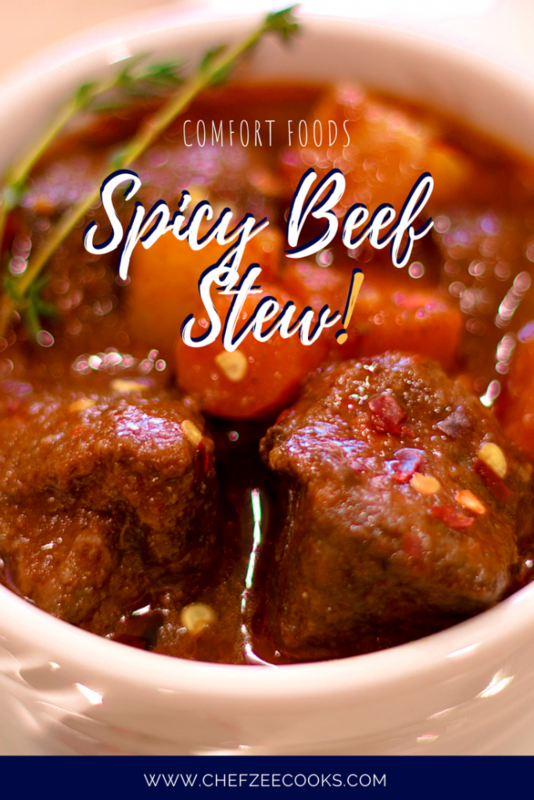 My Beef Stew recipe has evolved over the years and it changes every so often as I become inspired by other foods that I eat. 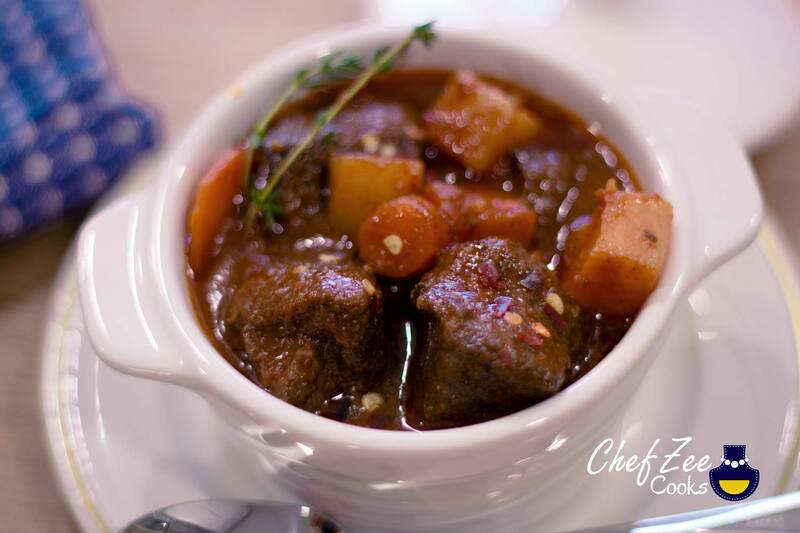 Growing up, beef stew was a simple meat, potatoes, and carrots dish. But while I was in college at Syracuse, I was exposed to a world of fall harvests, fairs, and festivals. I learned just how delicious fresh sweet potatoes were and how there was more to a sweet potato than candied yams during Thanksgiving. It was then that I began experimenting with my beef stew recipes and adding traditional fall harvest veggies. My Beef Stew recipe changed again when my best friend and roommate had a really bad day. I offered to make her her favorite dish and she requested, Spicy Beef Stew because it reminded her of her Nigerian Auntie Stew Beef. Now while, Stew Beef and Beef Stew are two very different dishes, I went with what I knew and remixed my Beef Stew recipe to have a kick. Alas, my Spicy Beef Stew recipe was born and I’ve been rocking with it for almost 10 years. In the end, this recipe was born and raised in Queens, NY, came of age in Syracuse, emerged from the ashes in DC, and finally found its way home in Long Island where it’s been blossoming for the last couple of years. There are many more chapters left to this recipes as I’m sure it will continue to evolve as I evolve as a chef and cook. Nonetheless, I’m happy to share one of my most personal comfort foods recipes in my arsenal. There adobo, ground oregano, sweet potato, and hot peppers. It’s a lethal melange with sweet rewards. Spicy Beef Stew is a dish that will triple in deliciousness if you eat it the next day. It’s tempting to eat it right away, but if you can wait then you won’t be disappoint. If can’t, no worries just know that your leftovers will be the story of legends! I personally love making this dish on a Sunday night and packing it for lunch for work for 2-3 days. I get so giddy that sometimes I can’t even wait until my lunch break to eat it. Hope you enjoy! Buen Provecho! Don’t forget to Pin this yummy recipe to your boards! Let the stew boil until it reaches your desired thickness. Note– the longer it boils, the thicker it becomes. The stew will also thicken once the dish cools. The longer this dish marinates, the better that it will taste. It's best to brown the meat on medium to flame in order to lock in flavor & color. In the end, the best way to have this dish is with white rice, tostones, or even some delicious bread. This dish will taste infinitely better the next day once the flavors have had a chance to set. This is the best cooking website on the planet. Every one of your dishes has been spectacular. I have shared your website with so many friends. I am so excited to make this dish especially since it will be snowing this weekend. I am sure you say this somewhere, but what do you mean by sopita? Is that a latin product I can buy in the store? If so, what brand? Thank you so much! Keep the recipe coming, my kids and husband are always so happy with your dishes! Thank you so much for stopping by! Sopita is a Spanish word that I use to mean chicken bouillon cubes 🙂 You can find it in many stores either in cube form or powder. I hope this helps!